PORT ALBERNI – A voracious new pest is marching its way through Vancouver Island forage crops. “Them” are Mythimna unipuncta, or True Armyworm. 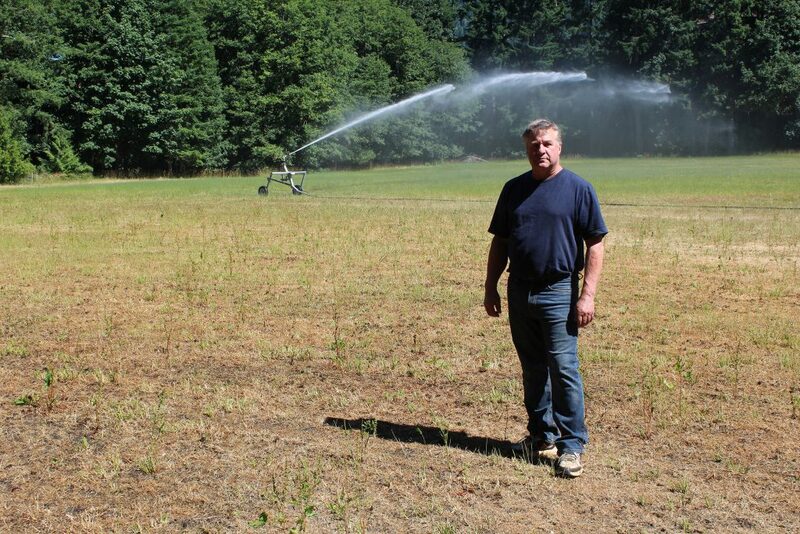 Collins is aware of about 1,500 acres of forage that have been affected in the Alberni Valley alone. This could mean a 75% reduction in the area’s forage crop this year. By mid-July, armyworm had been identified in the Alberni Valley, Comox Valley, Cowichan Valley, Ucluelet, Tofino and Powell River. The infestation has been particularly intense in the Alberni Valley where agrologists counted more than 150 larvae per square foot in one field. In the Comox Valley, counts are at 50 per square foot. The recommended threshold for treatment is five. True Armyworm is a cutworm, the larva of the White-speck Moth that overwinters in southern areas of the Americas and occasionally blows north on the wind to Canada. In the past, it has appeared in Manitoba and Ontario and occasionally other provinces east of the Rockies. “It’s quite an anomaly that it’s over here. We think it came in on the spring storms in late March or early April,” says Tracey Huppelheuser, entomologist with the BC Ministry of Agriculture. Borne by the wind, the moths would have laid their eggs on crops in the early spring. When the eggs hatch, larvae feed for about a month in June and early July. Once the larvae get to about 1.5 inches in length, they pupate and emerge as adult moths in early August. Armyworm feed on oats, wheat, fall rye and barley as well as forage grasses. They may also feed on field and sweet corn, especially late-planted corn. Though larvae feed primarily on grasses, broad-leafed plants such as beans, peas, carrots and cabbage are also susceptible. The presence of armyworm may have been detected late because the moths and larvae are nocturnal, making the outbreak seem more sudden than it was. Both the moths and worms are rarely seen during the day unless you go looking for them. An infested field shows minor signs of stress or slightly reduced yields until the worms hit their full feeding frenzy. Now that producers are aware of the problem, Huppelheuser says they can use different options to manage the worms when the next generation emerges in August. Producers who are not organic have other options, including Coragen, a Group 28 chemical recommended by the Manitoba government. Producers should spray before larvae are three-quarters of an inch long to reduce the amount of damage to the field. Huppelheuser and her team at the BC Ministry of Agriculture will be bringing in pheromone traps and light traps to help control the adult moths. Aside from spraying, she recommends grazing affected areas or cutting the hay early to salvage the next cut. While treatments are available and the worms aren’t expected to over-winter, producers on Vancouver Island stand to face a critical shortage of feed this year. The province isn’t likely to step up with compensation for the losses, either . In the Alberni Valley, producers face some hard decisions.